I am solidly on the side of not starting Christmas preparations until Thanksgiving is over. My girls did manage to sneak in a little Christmas music on the car radio prior to Thanksgiving Day, but I did mildly protest! Now you may be like my daughters, ready to start celebrating the Christmas season at the beginning of November, and that’s fine. Regardless, Christmas preparations are now in full swing. This past weekend we got our live tree, decorated it, and are now asking Alexa to play us Christmas songs every morning. The wreath is on the door, and the advent calendar is hanging on the wall. But I’m just not feeling it yet. I love the tree, and how cozy it makes our house feel. I’m happy that the stockings are hung. And I’m not in the throes of gift-buying madness or cookie-baking panic, either. I just don’t have that Christmas spirit. 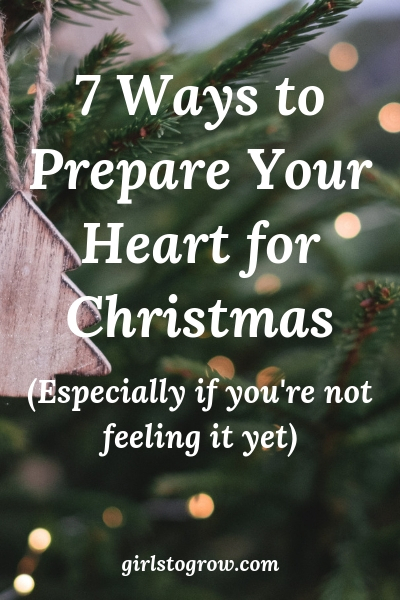 We still have a while to get there, but if you’re like me, maybe one of the ways I’ve listed below will help us get our hearts ready for this Christmas season. 1. Read an advent devotional or follow a Christmas-themed Bible reading plan. I just started Ann Voskamp’s The Greatest Gift: Unwrapping the Full Love Story. Technically the book starts on December 1st. However, I know I’ll miss a couple of days somewhere in the month, so I started a few days early. Other activities like lighting advent candles or decorating a Jesse Tree can help get you in a Christmas frame of mind. I shocked my girls earlier this week when I confessed that I’m not a big fan of Christmas hymns. They made me feel like I’ve been living a lie all these years, complimenting them on the Christmas piano pieces they’ve played in church or at recitals when I’m not a big fan of the songs, lol! There are a few traditional hymns that I like, but I also really enjoy songs from Christmas cantatas that I’ve heard performed (an all-time favorite being Ten Thousand Hallelujahs. Here’s one of the songs.) The point is, find seasonal music that causes you to think about Jesus’ birth. (Christmas Grace is a new favorite of mine this year.) Add in a few fun Christmas tunes, too! 3. Start planning your giving. Yes, my like-to-be-organized self makes a list of who we’re buying gifts for, how much we plan to spend, and all that good stuff. But let’s go beyond that. Who can we bless this Christmas season? Is there a person you could help that can likely never return the favor? What about anonymous giving? Whether we bake cookies, deliver a meal, or find a great deal on a gift we know someone will love, let’s get the focus off of ourselves. We truly receive a bigger blessing when we give rather than when we’re on the receiving end. 4. Find good Christmas entertainment. Watch A Charlie Brown Christmas, with the kids or by yourself. Maybe a Hallmark Christmas movie will inspire you. As a family, listen to a Christmas-related audiobook or read one aloud yourself. 5. Read the Christmas story in Luke 2 every day between now and December 25th. Go back to Luke 1 and read the history of Elisabeth and Mary. Go over to Matthew 1 to read about Joseph, and Matthew 2 for the story of the wise men. Meditate on the people and events that surrounded the birth of baby Jesus. 6. Write down a list of ten reasons why Jesus being born at Christmas is important to you. Want help getting started? Jesus came to earth to be born as a baby because of God’s great love for us. Because Jesus came to earth and submitted to God’s plan, our sins can be forgiven. You get the idea. Once you have your list finished, read through it once a day. 7. Attend a Christmas-themed event. Go to a play, a musical, a tree lighting, a parade, a big Christmas lights display, or a concert. There are likely all kinds of community events in your area centered around Christmas. See if the Christmas spirit is contagious! The Christmas season is just getting underway, and I hope you’ll enjoy these next few weeks as we prepare to celebrate Jesus’ birth. I am definitely NOT feeling it yet, so did I ever need this post, Tracey! Of course, I love it all but am especially intrigued by #6. I’m going to brainstorm this list while I’m walking! 🙂 Blessings to you on your Christmas season, my friend. And by the way, if you need another Christmas music idea, Hillsong’s “The Peace Project” is 100% gorgeous, and its lyrics are full of Biblical truth. Hope you and your family enjoy a wonderful Christmas season!! I’m not really feeling it yet, either, but I figure it’s okay since Advent doesn’t start until this Sunday. 🙂 My children keep pestering me to get out our Christmas decorations, and that would probably help get me into the spirit, especially the music and the movies that are packed away. What about Handel’s Messiah? I love listening to that at Christmas although I guess it’s not technically Christmas music. I have also decided that sometimes I just can’t make myself get into the Christmas mood, and that’s okay, too. It’s possible to celebrate without really feeling it. I enjoy Handel’s Messiah, too. In fact, our daughters’ school choir is performing that (or at least parts of it) for their Christmas concert this year, so I’m looking forward to hearing it live. You’re also right about being able to celebrate without necessarily feeling it. I know several families who have lost loved ones in the past couple of weeks – and even in the last several months – and I’m sure that can make it harder to “feel” in the Christmas spirit when you’re grieving. So thankful that we can meditate on Christ’s birth and all that it represents even during those years when trials make celebrating during this season a little bit harder. Eventually I’m going to get around to blogging about this, but my number one favorite thing to get me in the Christmas spirit is to go to this Christmas pageant put on by special-needs adults who live & work in a Christ-based community not too far away from our house. It’s a new play every year, and there is nothing that jumpstarts my heart like watching these amazing people and their pure heart for Christ. They can help me refocus on the true meaning of Christmas better than anything I’ve ever found! I think it’s so valuable, because I feel like it can reach secular people without them feeling like they are being preached down to, it’s super short so no excuses, and it includes an action for every day. It’s obviously not the only Advent reading l do, but it’s my favorite to share with people, because it’s short, powerful, and manageable. I can understand why that Christmas pageant would be the perfect thing to get you in the Christmas spirit! If I lived nearby, I’d go right along with you!! Thanks for sharing that link to busted halo. Never heard of it before, but I love that it’s short yet packed with a powerful truth related to Advent.